I have been playing Street Fighter ever since the first game. One of the constants between all the games in Capcom's series of fighting games is the character known as Ryu. Ryu is the go-to-guy for newbies to the fighting game genre. If you can become sufficiently good enough to be able to fight with Ryu, you can pick up and learn how to use just about any character in any fighting game. I love the way Ryu fights and all his moves. He has appeared in many games and has had different tweaks to his appearance and abilites. It's no surprise that there are many different version of him in MUGEN. Most of these I got before I started this blog, so i don't know where I originally got them from. If you know who the authors were for any of the characters listed below and a more appropriate place to download them from please leave a comment below. I'm also interested to know which version of Ryu you have to have in your MUGEN roster. Thanks! Here are some videos of demos I made to to demo some of the versions of Ryu that I found. The image hosting site I like to use seems to be down...I apologize as for the version I missed, they aren't here because I don't know about them. If you don't mind please leave a link to any version that you know about in the comments I will include them in an update. I also hope that the images should be back soon. 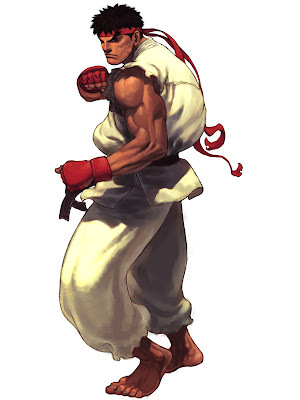 Where can I find the "regualr" Ryu thats in SF III series? I'm looking for the "real" unedited version. Thanks!